One trend we’ve been tracking here recently is Tiger Children taking over the social justice jihadi racket. You might think that just because you are poor and black that you’d get a leg up in the struggle for, say, a leftist NGO job, but … look out! The hardest-charging immigrants are coming from 10,000 miles away to outhustle you for your black privilege. These well-fed scions of Asia’s upper classes just want it all more than some poor African-American kid from the slums and they’re willing to be the most insufferable brown-nosers ever to get their hands on some juicy black privilege. Ziad Ahmed is a 18-year-old senior at Princeton Day School. He is an American-Muslim, Bangladeshi, and passionate social justice activist. Ziad founded a teen organization, redefy (www.redefy.org), committed to furthering equality. Redefy has grown immensely with over 250 students internationally on the team, over 3,000 likes on facebook, and over 60,000 hits on redefy.org. His work has been commended by President Barack Obama personally, PBS, CCTV, and other notable sources. Ziad has also worked for the Martin O’Malley 2016 Presidential Campaign, holding the role of Co-Head of YouthForOMalley. As he hopes to further his political engagement, he has also interned with Congresswoman Bonnie Watson Coleman in her district office. He has also interned for the US State Department as a VSFS intern. Furthermore, he also volunteered for the Hillary Clinton 2016 Presidential Campaign, focusing on Muslim Outreach efforts. As an aspiring entrepeneuer, Ziad has co-founded JÜV Consulting Inc. (www.juvconsulting.com), which is a youth consulting confirm. Slogan: “Current, Curated, Creative: Meet Generation Z, the generation after Millennials, the seemingly unidentifiable generation of current teenagers: sought after as customers and misunderstood as people. Understanding teens is posing a growing challenge to companies, non-profits, and brands everywhere. Overwhelmingly though, Ziad is just your average teenager trying grappling with identity, struggling to balance it all, and pursuing his passions. Maybe, hopefully, this kid isn’t for real and he’s just a Clickhole parody? I’m guessing Ziad Ahmed’s dad is Shakil Ahmed. Here’s a 2011 profile of this “secret genius” during his days at Citi before he started his own hedge fund. But I could imagine making an exception in Ziad’s case. Not surprisingly, the experience was an inspiration for Ziad to expand his work with Redefy…. by that same intense pasty flash . to drown out his sobs. Okay, I get it, you don’t like white people. English is the official language of this great nation. Black people are more dangerous. The axis of evil is our greatest threat. Native-American genocide did not occur. Andrew Jackson is a hero. They’re not just teen experts. They’re actual teens. And they’re for hire. In the summer of 2015, at a Cornell University camp for high school students, a teenager from California named Melinda Guo met a boy from New Jersey named Ziad Ahmed. They shared an interest in business, marketing, and philanthropy. “You’re probably going to be the only person I keep in touch with after this,” Ahmed told Guo. 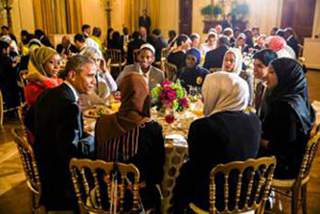 … Ahmed was devoted to a diversity nonprofit he’d started, which had gotten him invited to the White House’s annual iftar dinner—held after sundown during Ramadan—the previous June. Guo and Ahmed hoped to work on something together, and that October, Ahmed called Guo with a pitch. He wanted to create a consulting firm focused on people like themselves: members of Generation Z. Those born after 1996 make up almost a quarter of the U.S. population and wield $44 billion in buying power. … “One day I was like, ‘Wait, what about Jüv,’?” Guo says. It brought to mind juvenile or rejuvenate. Plus, the umlaut looked cool.